Ethiopian marathoner and Olympic silver medalist Feyisa Lilesa was reunited with his family after months of separation following his protest of the Ethiopian government at the 2016 Olympics in Rio de Janeiro. In the closing meters of the Olympic marathon, Lilesa crossed his arms in an “X” shape to protest the slaying of the Oromo people in Ethiopia. The Oromo are the country?s largest ethnic group and are being oppressed in response to their peaceful protests in favor of political reforms. His demonstration garnered global attention following his press conference comments, where he said that he feared for his life and believed he would be killed or held captive if he returned home. Ethiopian government officials invited him to return home but he refused. He spent three weeks in Brazil after the Summer Games before he arrived in the United States in September on a special skills visa. He eventually settled in Flagstaff, Ariz., to resume his training while also trying to connect with his family through social media and email. ?First, I want to thank Waaqa (God) for reuniting me with my family. I also am grateful to the US consular staff at the embassy in Addis Ababa, Ethiopia. ?Second, I would like to thank my family for their patience and understanding during more than six months of my absence. And my friends and everyone who supported us during this time. I am really happy to see my family. But I am also filled with mixed emotions. That’s because it’s always been my wish to live in my country, with my entire family, and among my people. In fact, I have never imagined I would be exiled from my country and be separated from my people. ?Regardless of whether I had enough to eat or I went hungry, whether I had a pair of cloth or not, in times of happiness and sorrow, it was my wish to live among my great people – who raised me with a sense of Oromumma (Oromo identity) and who taught me about love, respect, history and courage. ?But despite my physical safety here in the US and now a family reunion, the Ethiopian government’s ongoing abuse of the Oromo people gives me no rest. ?No one builds a family with the intention of going into exile. Instead to live in one?s own country and ensure familial continuity. Unfortunately, exile, however dreadful, has become my fate and the fate of many Oromos. ?As I celebrate this small personal victory, I want to make sure that we don’t forget the plight of millions of Oromo and other Ethiopians who are still being killed, beaten, imprisoned, dispossessed and kept in poverty. ?Toward that end, I renew my call to the US government and the international community to re-evaluate their foreign aid and other dealings with the Ethiopian government in light of the worsening human rights situation in the country. I urge them to stand with the Oromo and all oppressed nations in Ethiopia. The struggle continues. 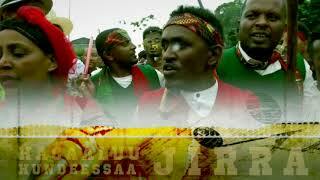 The Oromo people will win their freedom. Until victory is achieved and justice is served for those who shed their blood in the merciless killings, I will continue to resist and stand with my people. My commitment to this cause is not simply raising my crossed wrists over my head after every race. I am prepared to do all it takes to help my people win their freedom. ?I will continue to speak out against injustice and its perpetrators using my platform. My biggest wish is to see the freedom of my people – all people, in every country. ?Thank you!? Lilesa is slated to race the London Marathon in April. Last month, he showed flashes of the speed that got him on the Olympic podium as he clocked a?1:01:14 for second place in a photo finish at the Houston Half Marathon. ?He also took fourth in December’s Honolulu Marathon.